Question: What tactic improves the quality of your content, increases traffic and makes marketing way more fun? Think about it. It’s lonely to sit down, day after day, week after week, pumping out one article after another. It’s also boring. And a little sad. Just think of all of the thousands of bloggers out there, sitting alone in a home office, fingers on the keyboard, tapping out words in 12-point Arial. Another day, another post. Ok, I admit, that’s me right now. But it’s not all I do. I also invite others into my writing and content. I reach out to people. I collaborate in my content marketing. And it’s my favorite part of the job. I’m not just talking about collaborating with people inside the company (but yes, Amanda is a terrific editor and a key ingredient in all of our marketing). I’m talking about collaborating with people on the outside. Experts from around the world. Friends, influencers and allies. They make your content better. Their wisdom, expertise and insights are gold. And a few of their nuggets can add serious value to your piece. It’s also a fresh voice that breaks up that monotonous thing you were about to publish. They can help drive traffic. Your contributors have an audience too. And since they contributed to your piece, they are likely to share it. The technical term for this is ego bait. But it’s better to think of it this way. They make marketing more fun. And that’s important. Maybe the job hazards in our industry don’t involve forklift accidents. But there is a real risk of burnout. Let’s face it, it’s a lot of work to publish 2.5 million posts …every …single ….day! So anything that adds fun is a good thing. And working with others keeps it interesting. That’s what friends are for. Don’t forget to check the fun report in your Analytics! So now we know the secret to loving our jobs while making better content with more traffic, let’s jump into the practical details. There are probably more than five, but here are the big ones that you’ll see most often. I’ll put these in order from the simple and quick to the full-on partnership. This one is more about content sharing than co-creation. And it’s very simple. While writing an article, you add a quote that was written by someone somewhere. The quote should strengthen the writing, adding insight or evidence. Now when you publish the piece, you let them know that you quoted them with the hopes they will share it. Often you let them know just by tagging them in a social post, so they’ll see it in their notifications. The downside is that they weren’t expecting to be mentioned, they aren’t really invested in the content, so they aren’t that likely to invest much effort into sharing it. Still, you can make this more effective in a few ways. Being very gracious when mentioning them. Add a personal touch. Try email if appropriate. This one is my favorite. It’s a fast, friendly way to upgrade your content. As you write, watch for weak spots. Where did you make a claim that needs support? Where is your article boring? These are where the quotes go. Next, you reach out to an expert and ask nicely for a contributor quote. It might be someone who is already in your network. That’s easy. If the perfect contributor isn’t a friend yet, then you might want to let them get to know you a bit before asking for help. There are a lot of ways to connect to people online. If they’re a big time influencer, take it slow. You’re a journalist. Contributors are your sources. If you can, add a contributor quote to every article. Make it one of your editorial guidelines. Be specific and brief when reaching out. They’re busy! Tell them the ideal length and when you would need it. Even better, share a draft of the article so they can see how and where their quote would fit in. Add their face! It really brightens the place up. Link back to them. Better yet, ask them where they would like you to link to. It helps give them a bit more value for their effort. And how do you make it easy for them to share it once it’s live? We’ll get into that in just a minute. As with the “quote and mention” above, you can let your contributors know the post is live by tagging them in social media. 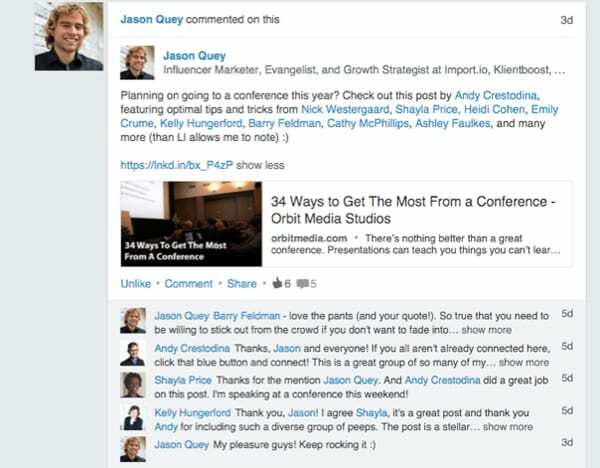 Here’s a screenshot of the content promotion champion, Jason Quey, using LinkedIn to mention the contributors to a collaborative piece of content. It’s a popular format for a good reason. Round ups work pretty well. They hit all three notes of quality, traffic and networking. They’re scannable like a list post and they’re filled with ego bait. But there are two very different ways to do them. Panel of Experts. A small group of experts answering a short set of questions on a common topic. The reader can see different but related points of view. The experts might agree, they might not. Since each is answering several questions, the reader goes deeper. The Mega Roundup. Many people answering the same short question. Sometimes dozens or even a hundred people all contributing a short blurb. As a reader, I’m biased. I prefer the expert panel. These mega roundups are getting so big, that I just scan through looking for familiar faces. I mean, this is a lot of people. But the quality depends on the contributions and the curator’s ability to organize and add value. A good example is when we asked some of the top SEO experts to debunk the myth of duplicate content. Ask great questions: Try questions that others are unwilling to ask, or that elicit a personal story. Pick real pros: A lot of “experts” give advice so common, it’s boring. Edit down the contributions: If your expert sends you a great insight, but they start with 50 words of “throat clearing” language, cut it out. Add your own insights: If you have a lot of contributions, combine them into groups, and add a paragraph summary with your your input. 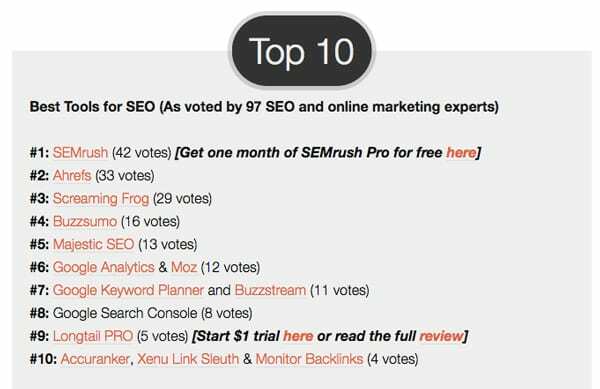 Example: Robbie Richards ask 97 experts to list their top SEO tools. But he didn’t just post the list. He turned this mega-roundup into a survey. By ranking the top ten by the most “votes” he added value and insight. Most podcasts and webinars are based on this format. So are TV talk shows and many live events. If you get the right expert, you’ll want to squeeze every drop of wisdom out of them. Do your research up front. Are they a writer? Read their latest writing. Are they a podcaster? Give a listen. Be ready to jump into their passions. And if appropriate, congratulate them on something in their personal life. Be quiet. It’s about them, not you. The interviewee should be doing 95% of the talking or writing. Ask follow up questions. Q & A isn’t always a conversation. Real dialog means you listened to their answers and let things flow from there. Even if it’s an email interview, send a question, get an answer, then send a question based on their answer. Example: Wine & Web is a monthly teaching event in our office here in Chicago. 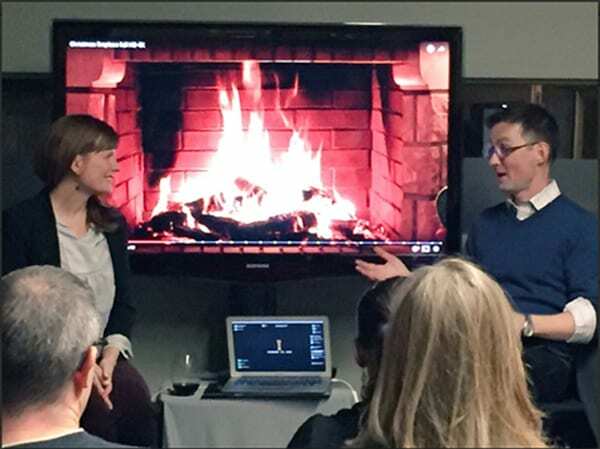 Each year, the last event is me interviewing Gini Dietrich in front of a digital fireplace. It’s an hour-long deep dive interview. Gini’s an expert on PR metrics, and we are lucky to get her insights! Think about it. Every guest post is a collaboration. It’s almost a transaction. The guest brings the content, and the blog brings the audience. But there’s more to it. Note: If people often reach out to you to write for your blog, it’s likely that they are looking for another benefit. They want the SEO benefit of a link. They are using guest blogging to increase their domain authority. It’s not necessarily spammy or unethical, but it’s important to understand their motives. Give them guidelines. If you have a guest blogger strategy, you’ll save time and confusion by documenting your requirements for guest contributors. 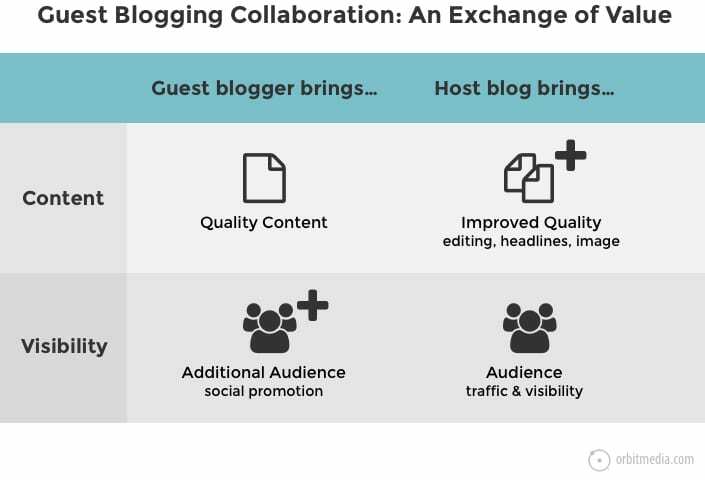 Make your guest blogging guidelines a page on your site. Here’s ours. Push for more value. I’m honored to say that I’ve been published on some of the best marketing blogs. They all have one thing in common. They all pushed me to make the content better. Add details. Add examples. Add value. The best blogs have relentless editors. Help them share. Once it’s live you can send along an email with the following items to encourage and simplify their job in social promotion. Well, actually there is. It’s at the end of the word marketing. But you get the idea. Collaboration, and I sincerely believe this, is the biggest difference between good and great marketing. There’s just no substitute. We’ve shared a lot of advice on this blog over the last 10 years. This might be the best of it. If I knew who said that, I’d tag them when sharing this on social media. Perfect timing. Just met with a client yesterday and discussed some the challenges around creating content. This post is a great share to address that pain points with solutions like these outlined in this blog. Perfect timing here, too. One of my clients wants to increase their content volume along with leveraging “expert” insights. The goal is to attract the interest of industry thought leaders and investors to boost brand awareness and encourage new business partnerships. It’s so much more than simply “making sales” from end users. We’re working with an IoT product and there’s simply a lot of opportunity to use content to actually BUILD business via influencers and the greater marketplace. I agree that collaboration works best when you build a relationship over time and define your needs to minimize work by contributors. Another key point that can’t be underestimated: Don’t just go after the big names. So true. 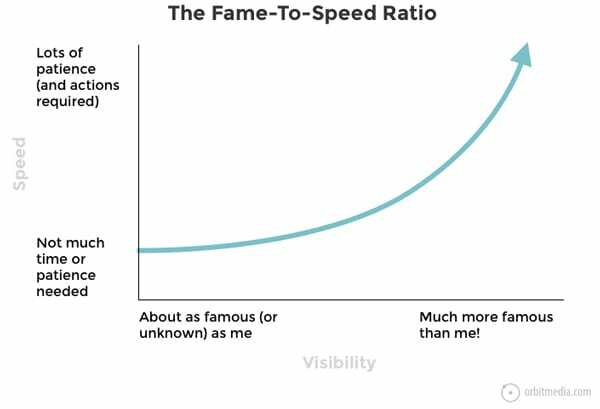 That fame-to-speed ratio is one reason. Another reason is that getting shared or mentioned by a celebrity often doesn’t really do anything at all. Smaller networks are often more passionate and engaged. I’m glad your in our orbit of connections, Heidi. Thank you for the contribution, as always! I’m working on a series of blogs right now that was inspired by your webinar chat on cognitive biases. I’d like to collect real life stories from marketers and businesses recounting occurrences of biases influencing decision-making (positives and negatives). You in? Reach out anytime on any channel. Andy speaketh the truth. This was one of the big changes we made in our approach to content at the beginning of the year, and our results have been spectacular. And it’s true — everyone loves it! Win for the clients because they get exposure and great networking, win for the collaborators because, well, they get exposure and great networking. I always ask for a backlink to our site after we post, and I also include short audio snippet interviews that I post to soundcloud. Helps ye olde time on page metric. 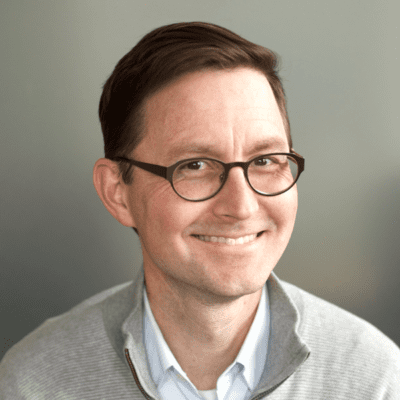 Thanks Andy – from Winbound and all our clients! I love how you embraced this approach, Greg. You totally ran with this. So great. And I’m thrilled to hear that it’s worked so well. I hope the “Fun” report in your Analytics is looking good. See you soon. Great article! 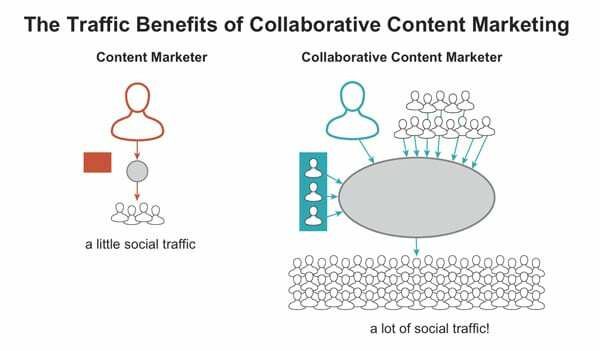 Collaboration is key to building trusting relationships, so why shouldn’t this also apply to content marketing? Perfect timing here, too. The goal is to attract the interest of industry thought leaders and investors to boost brand awareness and encourage new business partnerships.